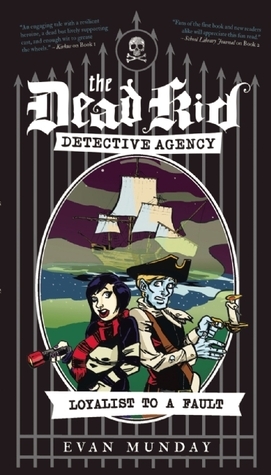 I’m a huge fan of Evan Munday’s Dead Kid Detective Agency series, so I was thrilled to hear that book 3 was coming out this Fall. Loyalist to a Fault has all the trademarks that make Munday’s writing such a treat — 1980s/90s pop culture references, middle school hijinks (school dance!) and a historical mystery. Throw in a ghost pirate who breaks into the town’s museum, and my little museum nerdy heart was all a-twitter. The unifying thread behind the Dead Kid series is a mix of Scooby Doo meets Nancy Drew goes goth — October Schwartz befriends some tween ghosts in her neighbourhood cemetery, discovers that they’ve all died under mysterious circumstances, and vows to solve each of their murders in turn. The ghost whose death is investigated here is 18th century British settler Cyril Cooper, whose story involves spies, pirates and some mysterious historical documents involving his family. Munday ratchets up the antics in this instalment, which wasn’t a huge draw for me, but which I admit may appeal to the kids this book was actually written for. Among the ghosts’ superpowers is the ability to detach and reattach body parts, and all the tossing about of heads and limbs was just a bit much for me. I did enjoy the middle grade romances in this book’s subplot, in particular a couple of romantic possibilities for October herself and a potential match between a couple of the dead kids. The scene at the school dance was hilarious and fun, and shows just how perfect a battleground a school gym can be. I did wish the subplot involving October’s living friends was explored a bit more (the resolution felt a bit of a letdown), but I’m glad there are several more books in the series for this to play out. I’m a total museum geek, and I especially geek out over historical archives, so I was glad that Munday made the Sticksville Museum such a huge part of this story. As a fan of British cozy mysteries in small towns, I have to admit being disappointed that the Sticksville historical celebration wasn’t quite given as much focus as I’d hoped, but to be fair, I can imagine that most other readers would have chosen to focus on ghostly pirate battles as well. The mystery behind Cyril’s death is solved, somewhat, but a whole lot of other questions remain. We end the book knowing who the murderer is, but unless I missed it completely, still completely in the dark on the motive behind the killing. Instead, Munday teases us with some big revelations about the overarching mystery of the series, hinting at a major series-end reveal that would explain everything. More significantly, he also hints at a link to October, which ties her in even more with the ghost kids and possibly explains the mysterious phone calls she’s been receiving. Munday is as witty and full of pop culture references as ever, but none of the lines quite struck me as much as the witticisms in his earlier books. I’d also be curious to know how his middle grade readers respond to the humour — I geek out over it because I understand the references to 80s cartoons and 90s TV shows, but I’d love to know how it connects with kids born after 2000. Overall, this is a solid instalment in the series, one that seems stronger as an instalment in a larger story than as a stand alone title. I’m intrigued by all the various plot threads Munday has in the air, and am curious to see how they all tie together in the end. And if you’re looking for a fun book to read this Halloween, you just can’t go wrong with a ghost pirate mystery. This entry was posted in Book Reviews and tagged 50BookPledge2015, ECW Press, Mystery, YA by Jaclyn. Bookmark the permalink.